It’s unfortunate that most of their defensive mechanisms don’t usually work. Depending on the type of caterpillar, whether they have sharp hairs or can blend into their background, caterpillars still get eaten. Who’s intelligent enough to get past their techniques? What eats caterpillars? As previously stated, if they can eat one, they can get past their defenses. Birds are well known to eat caterpillars very commonly. The different types of birds that prey on the different types of caterpillars vary from season to season. A few bird species include: canopy-dwelling birds, woodcocks, and robins. They all catch these caterpillars in a variety of ways. The canopy-dwelling bird will be flying high above the tree-tops and canopy’s waiting to find and capture one. Woodcocks and robins eat caterpillars as they’re on the ground casually walking around. They may even already be eating something else as a caterpillar catches their attention. Once that happens, they usually will go out of their way a bit, if necessary, to add onto their 3 course meal. Aside from birds, insects and bugs are other predators. These include the ladybird beetle and yellow jacket wasps. The wasps will carry their catchings over to their youth so they enjoy the luxuries. The wasps mainly feed on these caterpillars during the spring, or summer. One of the reasons a Ladybird beetle would enjoy snacking on them is because of their soft bodies. Humans are another well-known predator to caterpillars. Parts of Asia ,and some parts of Africa (such as South Africa), find these caterpillars to be a luxury. Caterpillars are filled with lots of proteins, fats, and other nutrients. You may find these being sold as delicious snacks in other parts of the world, it’s up to one’s self if they want to try it. Caterpillars have quite the journey ahead of them. After all, they’re meant to grow and mature into beautiful butterflies. So, what do caterpillars eat? Let’s find out. A caterpillar will begin their life feeding on leaves of either trees or plants. Actually, that is almost all that a caterpillar will eat. It’s their source of water, nutrients, and essentially everything. However, there are different types of caterpillars that will eat different things. For example, the monarch caterpillar will eat milkweed; the woolly bear caterpillar will feed on grass and clovers. 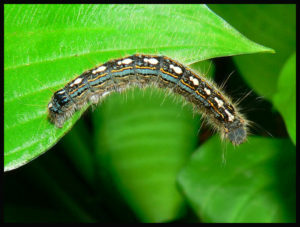 The plants and trees that the caterpillar uses as a source of leaves is actually called a host plant. Don’t forget to read more about the food-web if it catches your interest!